Hi, and welcome to my review of Oberlo, if you are thinking of starting a dropshipping business and want to know if this app can help you, I hope this article will help you decide. Dropshipping is one of the most popular methods to start an eCommerce business, it doesn’t require a huge investment to get started and it is relatively simple to operate. This is one of the main reasons this business model has become popular among new entrepreneurs and why it is a booming industry. 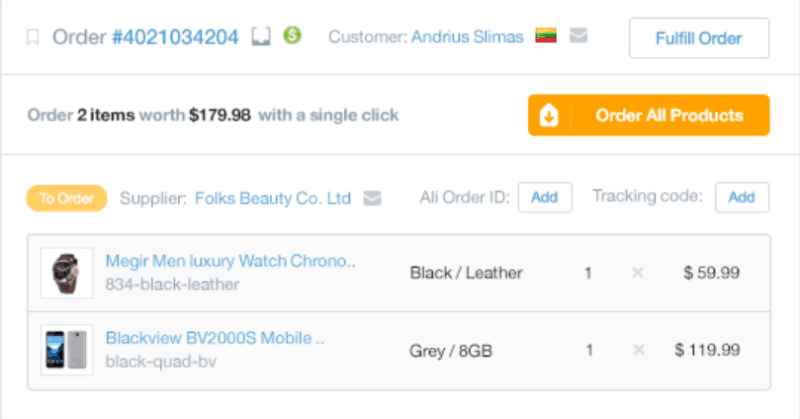 Oberlo is a Shopify dropshipping app that allows you to search and import products from AliExpress into your Shopify store with the click of a few buttons. It also comes with a host of other features that will help make your store retain customers, increase sales and help boost your profits. Dropshipping is an eCommerce distribution method in which the store owner never handles any of the inventory he/she sells. Dropshippers act as the middlemen between customers and suppliers.When an order comes in, the store owner will pass on the order to the supplier and they will deliver the item. The store owner will keep the difference between what they charged the customer and what they paid for it from the supplier. Profit margins in dropshipping can be anything between 10% – 300% depending on who your supplier is and where you dropship. For a more detailed explanation of dropshipping read this article. So, what exactly is Oberlo and how can it help you run a dropshipping business? Oberlo is a Shopify App that helps dropshippers import products from AliExpress to their Shopify store with little hassle. Its interface is clean and very easy to navigate, there isn’t a steep learning curve which makes it great for everyone. Delivery method – AliExpress has multiple delivery arrangements, the most popular with dropshippers is ePacket. Verified Supplier – Oberlo have their own database of suppliers that have proven to deliver exceptional customer service. Warehouse location – If you want faster delivery times, you filter to make sure that warehouses are located nearer to where you will be delivering. Order Count – Filter by the number of orders for any product in a given month. How many times the product has been imported into an Oberlo/Shopify store. These data points will be useful in determining if a product has the potential to be a winner or not. One of the best ways to gain customer satisfaction is to fulfil their orders on time and Oberlo makes this possible with their streamlined ordering process. Once an order comes, all you have to do is order the product from the Oberlo dashboard and they will take care of the rest. It really is that simple and straightforward. You will also be able to track the order from the moment it leaves the suppliers warehouse until it reaches its destination. Another fantastic feature, you will not have to worry about customers ordering items that are out of stock because Oberlo will alert you when an item is no longer available. This will allow you to either remove the item or find an alternative supplier of that item. The app will also update any changes in price, this will allow you to make any adjustment to your own price so that you always stay in profit. One of the great things about AliExpress is that there are multiple suppliers for many of the same products. What this means is that you can change suppliers very easily should you see that you will get a better deal. With Oberlo you can change suppliers with the click of a few buttons and your customers will not know the difference. 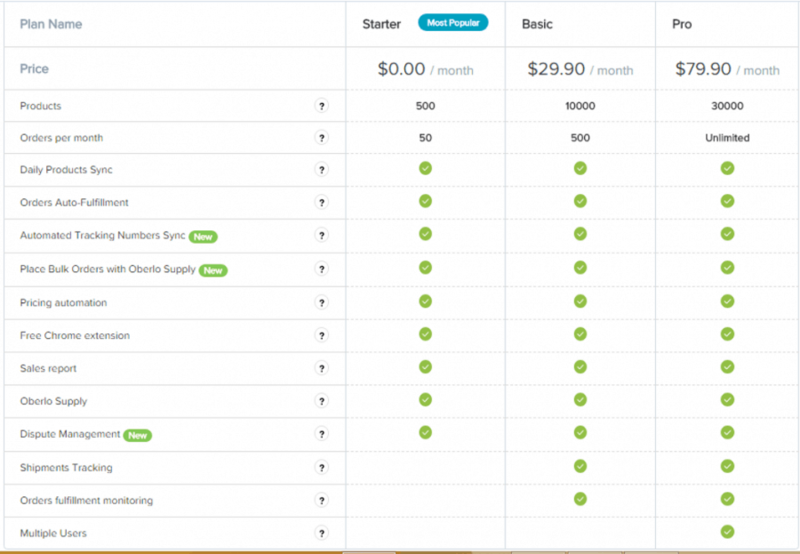 This is another time-saving feature, you can set up your own pricing rules for all your products without having to price them individually one by one. There is a more advanced feature where you can set pricing rules depending on the cost of the product, so for example, the pricing rule below shows that if a product is priced between $20-$50, it should be multiplied by 2 for the selling price. One of the issues with dropshipping from AliExpress is the length of time it takes for the item to be delivered. However, there are some products that can be delivered faster with a service called ePacket. Products that are eligible for ePacket delivery can be found by applying the ePacket filter within Oberlo. Most products that are eligible for ePacket delivery are small and lightweight and when you first start dropshipping, these are the types of products you would start with. You can edit product description, images, titles etc not only will this make you stand out from other people who are selling the same product but it will also have some SEO value should you want to rank for any keywords. You can track the sales of all your products and analyse which products are converting well and which are not. This will allow you to stop promoting products that are not selling well and put more effort behind ones that are. The sales dashboard will provide you with a total earnings report and provide stats for your top 5 selling items. Oberlo verified suppliers is a large database of the best reviewed and most trustworthy suppliers on the AliExpress marketplace. The suppliers have been handpicked by the Oberlo team so you know that the products and service will be of the highest quality. 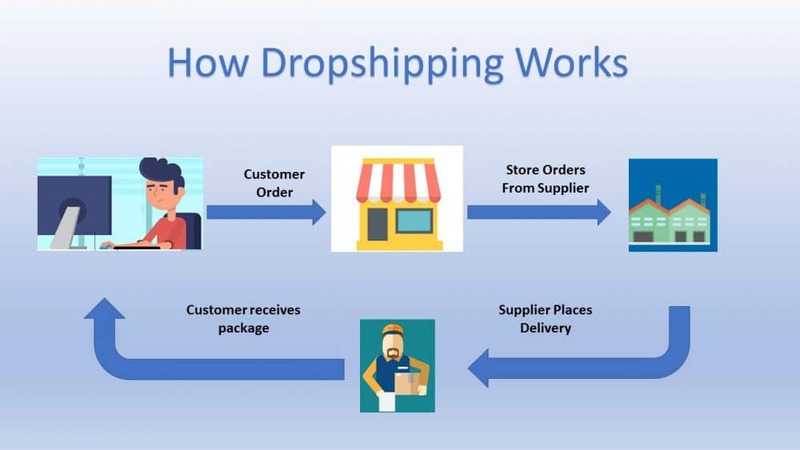 All the suppliers are aware that most of their business customers are dropshippers so they will not deliver items with promotional material that will let customers be aware of this fact. Even if you do not end up using the app, the resources alone will help you in your eCommerce business. They also have a very lively community forum where you can and ask for help and advise and learn from successful Oberlo dropshippers. There are three options you can choose should you decide to use the app for your dropshipping business. There is a free plan and two paid plans. Oberlo is free until you reach 50 orders per month (which hopefully you should do sooner rather later). The Basic plan is $29.90 pm and the Pro plan is $79.90 pm. There is another app that is very similar to Oberlo, it is called Alidropship and comes with many of the same dropshipping automation features as Oberlo. You can read my review of Alidropship and decide for yourself which one you prefer. I personally prefer Alidropship, mainly because it works with WordPress and I am very familiar with that platform (this website is built on WordPress). However, the one advantage that Oberlo has over Alidropship is that there is a free version of the app, Alidropship comes with a one time fee. With dropshipping becoming a very popular method to start an eCommerce business it was inevitable an app like Oberlo would be developed. It is a fantastic app and it will definitely make running a dropshipping business much easier. If you are new to dropshipping, Oberlo has a wide range of resources to help you and it does have a fantastic customer support system should you need additional assistance. Looking through their various blog posts and updates, the company is continuously improving the platform and this is reflected by the fact that Shopify acquired the company for a substantial amount in 2017. The only negative point I have to make is that it only works with Shopify and so you are stuck with one eCommerce platform. This can be a problem down the road if you decide to move to another platform as you will have to start over from scratch. However, I highly doubt anyone would want to move if their dropshipping business starts seeing success, which it hopefully will do for you. Oberlo is a fantastic dropshipping app, if you are thinking about starting a dropshipping business on Shopify, this app will be a huge asset. Hello Minhai, very interesting post here. I admit I know very little about e-commerce and Shopify. Your post has gotten my curiosity up. I did not realize the profit margins were so high with these programs. I take it that the Oberlo App does not work with word press and is only good with Shopify? It sounds as if you really want to make a go of this it would be better to get the Alidropship? I will keep your website in mind so I can check on this later on. Sounds really interesting. Hope to talk soon! Thanks for your comment,yes the margins can be pretty high if you dropship from Aliexpress,however,you must first find a good product to sell and make sure the product is high quality. I prefer Alidropship because it works with WordPress,however,some people may prefer Oberlo because Shopify is a very good eCommerce platform. Both essentially do the same job,at the end of the day,they are only tools and it is up to you to utilize them properly. Thanks for this in-depth Oberlo review. I was thinking of trying to work as drop shipper and am collecting data for the moment. I think Oberlo is a good choice to start with. Is it possible to work with Oberlo and also add other ali-express or independent products to our website? Oberlo can only import Aliexpress products,at the moment they do not support any other platform. Great information that is very informative that will really help your reviewer’s thanks so much for educating us and helping to point us in the right direction. Interesting app. Never heard of it before. I’ve been thinking about going into eCommerce, but haven’t really got a product of my own. Drop shipping could be a good way to test out the market that I’m interested in. But I haven’t had much experience buying stuff from Aliexpress. Is their product quality and customer service at par with Amazon? Thanks for your comment,its not on par with Amazons excellent customer service,however,it is still very good. The products are good and some are bad,luckily they have a feedback system,so you can see what scores customers have given suppliers for their products,customer service,delivery time etc and base your decision on that overall score. I love how you just give me the answer right up front, if this app is legit or not. Have you used it personally. I have heard about dropshipping as a work-from-home opportunity and have wondered about doing it. Do you have to have your own website to dropship or does the app give you one to work with? Thanks for your comment,you will need a Shopify store to use the app. The good thing is,you can get a 14-day free trial of Shopify and use the free version of Oberlo to see if it is something you would want to work with. Dropshipping is a good opportunity to start an online business,however,like all legitimate online money making methods,you will have to put in a a lot of work in the beginning and consistently work on your store. I want to try dropshipping but I’m not familiar with the pros and cons. Will you be able to outline some for me so I can make a decision of whether I should try out Oberlo or not? And you also mentioned AliDropship. How much more is it compared to Oberlo? If it is a reasonable one-time fee, I could save in the long-run. But I also want to ask, is it easier to manage a store on SHopify with Oberlo or on WordPress with AliDropship, for a newbie? Thanks for your comment,as to the pros and cons of dropshipping,I have actually written a whole article on dropshipping and have listed the pros and cons of this business model. You can check it out here. I personally prefer to work with WordPress as I am familiar with the platform,however,Shopify is a very good eCommerce solution and they have fantastic resources for dropshippers. So,it will come down to your own preference. I have used Orbelo in the past while experimenting with dropshipping. It was fairly a great tool and made it seamless to import products into my store. I didn’t know that they also had a feature to track sales to see which products are converting better than others. I may not have stuck with dropshipping long enough to realize this feature was available, but if I had known that I may have stayed longer with it. Thanks for such a thorough review. Thanks for your comment and I think the tracking feature was added on recently,one thing I really like about Oberlo is that they continuously try and improve the app. Thanks for the great insight into Oberlo dropshipping, Minhaj. The information and guidance you offer on the overall service is so very useful. Do you have experience operating a Shopify store using the Oberlo dropshipping service? If not, do you know of anyone I can contact to learn more about it and how they have done as a dropshipping merchant? Thanks for your comment,I have played around with both Shopify and Oberlo but have never run a store,that is in my future plans. If you want more guidance,I highly suggest you check out the free resources that both Shopify and Oberlo offer and also get involved in the community forums. You will find lost of help there. I Appreciate this honest review of Oberlo, I am familiar with dropshipping and the many apps that have been developed over the years to help people start a dropshipping business. I have looked at other similar apps like Alidropship and Dropified but what makes Oberlo the better option for someone like me is that the basic version is free which is great if you are on a tight budget. Thanks for your comment and I agree, what separates Oberlo from the rest is the basic option which is free for life, perfect for people why may not have a huge amount to spend. I like the other two you mentioned but Oberlo is the leader for the title of the best AliExpress dropshipping app. Hey, thanks for this in-depth review of Oberlo, I have been hearing a lot about dropshipping since I started learning about making money online and Shopify and Oberlo are names I always hear about. Dropshipping sounds like an easy business model to implement and Oberlo definitely makes it easier. I love all the automation features it comes with, especially the one-click import and one-click order fulfilment. Dropshipping is something I am considering to start and Oberlo will be on one of the apps I get when I start my dropshipping business. Thanks for your comment, I hope all the best for you and your dropshipping business. I am actually thinking of starting an AliExpress dropshipping business and Oberlo is one of the dropshipping apps that I have been researching to help me get started. I really like the automation features, these will definitely speed up many of the tasks that are required when running a dropshipping business.I really like their list of verified suppliers, this will help me narrow down the list of suppliers I can work with, what gives me confidence about this app is that Shopify purchased it for a considerable amount, this tells me that it works and it will always be supported. Thanks for the comment, yes one of the main reasons I advise people to go with Oberlo for AliExpress dropshipping is because it comes with so many good features, is well supported and is owned by Shopify. Thanks for this thorough review of Oberlo, I have been searching for a good AliExpress dropshipping app and Oberlo seems to tick all the boxes. Do you know if Oberlo lists suppliers from countries in Europe and the USA? I would like delivery time to be shorter than 2 weeks which seems to be the average time for an ePacket delivery. Oberlo looks easy to use and the interface is really tidy, how have you found it so far? is the support any good and do they update the software on a regular basis? Thanks for your comment, as far as I know, Oberlo does list suppliers that are based in the USA but I do not know if they list suppliers from Europe. If you would like more options for suppliers that are based in the USA and Europe, try Spocket, they have a huge database of legitimate dropshipping suppliers that are based in the USA and Europe. As for your other questions, I find the Oberlo is easy to use, the support is good and they do update the software on a regular basis.